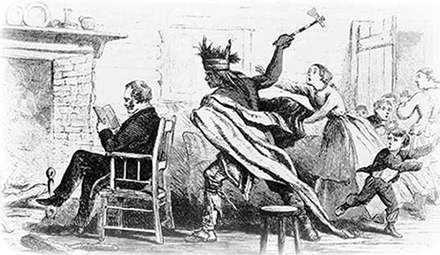 On this date in 1850, five Cayuse were publicly executed in Oregon City for the Whitman Massacre. Beginning in earnest in the 1830s, Anglo settlement in the Oregon Country presented for the native inhabitants of the Pacific Northwest the same Hobson’s choice that had confronted tribes further east long before: resist or accommodate. The New York-born couple Marcus and Narcissa Whitman* were two of the most notable figures among the hundreds, and then thousands, of settlers pouring into the territory every year. In 1836, they founded on the banks of the Walla Walla River a Christian mission to the nomadic Cayuse who roamed the territory. It’s in present-day Washington State, which was then part (with the current U.S. states of Oregon and Idaho) of a single frontier territory collectively known as Oregon. The Whitmans’ early settlement, offering medicine, education, and (of course) proselytizing, proved a success at first; it would become for several years a waypoint on the developing Oregon Trail. White diseases came with the settlers. The Cayuse people had already dwindled (pdf) to just a thousand or two after the decimations of smallpox and other plagues swept the region in the decades preceding. Now, outbreaks of measles were ravaging those remaining. Marcus Whitman, a doctor as well as a spiritualist, proved unable to check the new epidemic. Rumors went abroad that the missionaries were bewitching or poisoning the Cayuse, as the vanguard of a coming territorial conquest; the Whitmans themselves were very keen to the hostile feeling the situation had engendered and had even heard whispers that they were the targets of assassination plots. Bravely, they stayed. But that remark was only days before the terrible November 29, 1847. On that cold autumn Monday, a small party of Cayuse led by a chief named Tiloukaikt fell on the mission and slaughtered both Whitmans plus another 11** inhabitants of the little compound. This quick response might have forestalled a worse tragedy for the missionaries — but as far as the Cayuse went, the die was already cast. A volunteer militia of Oregonians under Cornelius Gilliam soon mobilized to retaliate, driving many Cayuse into the Blue Mountains. They were tried in Oregon City, the territorial capital at the time — a town of 500 or so on the Willamette River Falls — in a landmark case: the first proper death penalty trial in the young territory.‡ This would fall a little short of modern standards, and not just because it was held in a tavern for want of a regular courthouse. The prosecution was not especially rigorous linking all the defendants to specific violent acts, but the defense’s recourse to Cayuse cultural practices that held shamans liable for the failure of their medicine conceded the point by implication. The judge‘s final instructions simply directed his jury to “infer” the defendants’ culpability by virtue of “the surrender of the Defendants by the Cayuse nation as the murderers, the nation knowing best who those murderers were.” So why even have the trial? Kiamasumpkin, against whom no evidence was ever individually presented, went to the gallows insisting that he didn’t even arrive to the Whitman Mission until the day after the massacre. Fears that the quintuple hanging would stoke a running conflict with the Cayuse were not altogether misplaced, but over the subsequent years the dwindling tribe was simply dwarfed by over 30,000 newly arriving settlers lured by a congressional grant of free land. By 1855, the defeated Cayuse were forced onto the small Umatilla Reservation, ceding (along with the Umatillas and the Walla Wallas) 6.4 million acres to whites. The Cayuse tongue was extinct by the end of the century. Present-day memorial obelisk at the site of the Whitman Massacre, now a national historic site. (cc) image from Jasperdo. * Present-day Whitman College (Walla Walla, Wash.) is named for them. 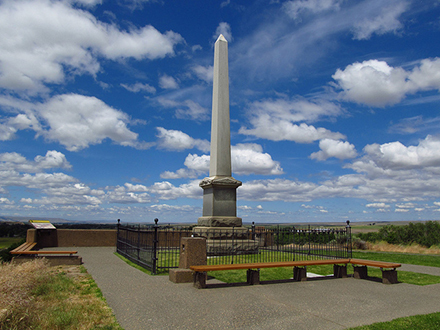 ** Figures of both 13 and 14 (inclusive of the Whitmans) are cited in various places for the Whitman Massacre’s body count; the discrepancy turns on whether one’s tally includes as a casualty Peter Hall, who escaped from the mission, fled to Fort Walla Walla, and then made a panicky attempt to reach The Dalles. Hall disappeared into the wilderness, and was never heard from again. † Ransom covered gratis by the Hudson’s Bay Company. ‡ The Espy file‘s index of U.S. executions lists only a couple of undated executions many years before under informal frontier justice. § Cousin to the recent First Lady Sarah Childress Polk. 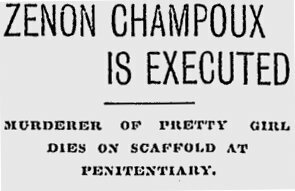 Its subject was French-Canadian laborer Zenon Champoux, and his crime was as flamboyant as his moniker: publicly planting a knife in the forehead of a dance hall girl who did not return his affections. 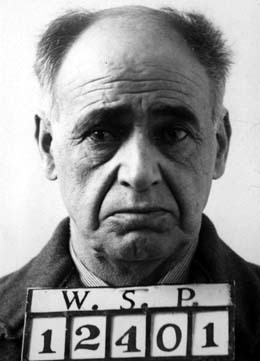 The first man executed under the auspices of the Evergreen State, we admit, is a milestone that’s a bit on the smaller side. But we think his name stands out admirably in the annals, especially paired with a characterization like the Seattle Star gave him: French degenerate. “Zenon Champoux, French Degenerate” — it’s the scoundrel who’s rogering your girl, or else the branding on his designer condoms. On this date in 1904, it was just the guy at the end of his rope. * Previously, hangings had been conducted by counties, in public. Laws removing them to the auspices of the state and behind the walls of a prison were in vogue at the time. Washington went on to abolish the death penalty in 1913, only to reinstate it again in 1919.